A couple of times a year, Eric Asimov, who pens the wine column, “The Pour,” for the New York Times, assembles a list of wines that he buys in the New York area for $20 or under that he can recommend for seasonal enjoyment. Asimov is one of those wine writers who I really enjoy—always informative, one finishes both knowing more about the region or producer and wanting to try the wines. Therein lies the rub . . . we usually carry or have access to only about half of what Asimov recommends. Alcohol sales are one of those “reserved to the states” rights, which means that there are 50 different distribution systems. Common to all states, however, is a 3-tier system starting with importers, who sell to distributors who in turn sell to retailers. Retailers in any state can buy wine only from a distributor domiciled in that state. If you have enjoyed wine in Massachusetts or New York, but come home to discover that we cannot get it, that is because no distributor brings that wine to Vermont. Believe it or not, it also works the other way, too. Some producers are so small that they do not have the wine to sell to big markets like New York City or Boston, but they have enough to sell to states like Vermont, Maine and Rhode Island. The other variable is cost. Wines that press the limit, that sell for $18-$20 in New York, will often be slightly more in Vermont if we have them. Usually the wines enter the US through ports in NY, NJ or even MA, then travel to us. I am happy to report, however, that we occasionally have the same wines for less than Asimov pays. We always celebrate that occurrence. That range captures lots of terrific wines in Vermont. Below are our picks of summer sippers—lighter-bodied wines, more whites and rosés than reds. These are both refreshing to give us energy as the dog days of summer arrive, and pair better with the beautiful fresh fruits and vegetables that adorn our tables as our gardens and orchards deliver their bounty. The grape, Lumassina, is a variety grown exclusively along the Ligurian coast. Because it is hard to cultivate and late-ripening, it would be extinct but for a few producers, like Tommaso Ruffino and family, who continue to work with it. Two of their 11 hectares are planted with it. The Punta Crena, Lumassina, 2014, has a fragrant nose that is floral and freshly green, bringing to mind tarragon. On entry, there is a light spritz, not as noticeable as a Vino Verde, then a rich, lemon-grassy flavor is followed by crisp grapefruit and almonds on the long finish. It packs a huge amount of flavor for this 11% ABV wine. This is another of those grapes, Jacquere, found only in one area– Savoie. Savoie is a French department that includes some of the Western Alps. It is mountains with alpine streams and meadows. It’s surely the power of suggestion or just association, but this wine seems to be all about the stoniness of alpine streams and the crispness of mountain air. Wow did we like this wine! Three of us tasted together and all exclaimed how much we enjoyed it. My notes say juicy fruit gum followed by flinty/slately/graphitely/minerally yumminess. It has a great mouthfeel– light, frisky, energetic. It will surely be making repeat appearances at each of our houses this summer. Jean-Philippe Fichet is one of the most respected vignerons in Meursault, letting place express its individuality rather than manipulating juice to produce a particular weight and flavor profile. Aligoté is the “other” white grape of Burgundy, never given the attention of Chardonnay since it cannot command those prices. Consequently, it has been pulled out of better sites, left to less desirable plots that generally yield tart, forgettable wines that are relegated to blending with crème de cassis for an aperitif kir. Jean-Philippe Fichet’s Aligoté far exceeds the low expectations associated with those humble origins. Producing only 250 cases, Fichet’s commitment brings us a light-bodied wine that over-delivers on flavors and finish. Sweet but tart Meyer lemon and kefir lime are accented by something that reminded me of a salty caramel. There is still a lot of acidity on the finish to carry those flavors for a lengthy finish. We have been fans of Edmunds St. John since we first tried a Syrah in 2002, though I am sorry to admit that I cannot tell you which one that was. For the past two years, I have been bewitched by Vermentino, principally those from Corsica (yes, rather than Sardinia), but also some others, including this one that is curiously but successfully co-fermented Grenache Blanc. Steve Edmunds has been marching to his own beat for 30 years. Garagiste before that became cool, working with varieties like Syrah (still not cool, but what a wonderfully layered set of flavors), Grenache, Gamay, Vermentino and Grenache Blanc. Looking for wines of balance rather than just powerfully ripe, Edmunds has let his passion and instinct drive his winemaking to terrific advantage. This wine is co-fermented rather than blended, so one does not get to predict the outcome. Still, years of experience have given Steve Edmunds the confidence to go with his instincts. It is a beautiful result. I have been nursing this bottle for three nights—jasmine, something green (for me cilantro but I love that), and a stony, salty, clean finish. Only 300 cases made. Fausta and Cinzia Cellario bring us this flavorful, refreshing and organic white from their 30 hectares of vineyards in the Cuneo area of Piedmont. The family work only with varieties indigenous to Piedmont. Favorita is Piedmont’s Vermentino, literally; according to Jancis Robinson, their DNA is identical. Cellario’s Favorita has a bouquet that ranges from pear and juniper to a salty sea breeze. In the mouth, it is medium-weight, with more of that briny, minerally, saltiness that gives the wine a tremendous lift and carries a gingery-pear fruitiness to a long and very pleasant finish. When we tasted Spanish wines together in early May, Menadé was a remarkably popular wine with the discerning Windham Wines’ women’s tasting group that strongly prefers reds. Verdejo is the principal grape grown in the Castillo y Leon region of Rueda. Menadé is organically farmed by the Sanz family who harvest at night to prevent oxidation, and ferment in steel with indigenous yeasts. The resulting wine is vibrantly fresh, with aromas and flavors of something green like bay leaf heading to grass, lime and a taut, electrically-charged minerality on the finish. This can be substituted for coffee to give you energy! Born 1989, Paul Direder may be our youngest winemaker, but he is not the least-experienced. He has been in the vineyards and cellar with his grandfather, Leopold, since he was able to walk and has been working his own vineyards since he was 17. The majority of the family’s farm, which Paul manages, is devoted to sugar beets. Paul’s personal passion, however, are the 12 hectares of vines that include Gruner Veltliner, Zweigelt and a small amount of Muller Thurgau. Muller Thurgau is an aromatic hybrid that includes Riesling as a parent. Paul D’s Muller has plenty of white peach and only a hint of something floral. A group of us tried it when it first arrived in the states—Winthrop and Rafael, of Artisanal Cellars, persuaded Paul to bottle some for the US market, for which 2015 is the first vintage. We all declared it a summer sipper—great flavors, good freshness, easy-drinking and affordable. In the 1970s or even 1980s, if you had a wine in a fish-shaped bottle, you had Verdicchio. No fish-shaped bottle this, and nothing like the insipid wine that came from those. Sergio Esposito, owner of Italian Wine Merchants in NYC, wrote a fun account of a family trip to Italy during which he visits several of the winemakers he imports, including the Sartarelli, Verdicchio Classico. 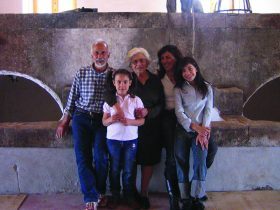 Esposito’s book is entitled Passion on the Vine: A Memoir of Food, Wine, and Family in the Heart of Italy. They enjoy several bottles of Sartarelli wine during an extended meal in Portonovo, on the Marche coast. Seafood and Verdicchio are a natural pairing. Head to Adam’s Seafood and get whatever is fresh—mussels, clams, shrimp, scallops and see for yourself. We first pulled the wine to sample when it appeared on our distributor’s website. Sivi Pinot? Slovenia? It turns out that Sivi Pinot is Pinot Gris and, in Slovenia, it has identity. For those who have eschewed Pinot Gris because of the flavorless, tart mass-marketed Pinot Grigios, we can recommend this as example of its possibilities. The Slavcek, Sivi Pinot has been a great success on the value-wine table at Windham Wines, and for good reason– it is delicious. The winery and estate name dates back to at least to 1769 where “Slavcevih,” which means Nightingale is listed in church records. Since many families shared the same surname, farms were named after different birds to identify the family. Slavcek continues local tradition in its winemaking as well: native varieties, hand-picked, practicing organic, aging in neutral oak and acacia barrels. The resulting wine is fairly rich, with plenty of ripe fruit yet a good vein of minerality as well. This is our 4th vintage of the Miraflors Rosé, each one a blend of about 70% Mourvedre to 30% Grenache Gris, made by Jean-Marc and Eliane Lafage from grapes grown organically at their estate, Mas Miraflors, in Rousillon, There is an interview with Jean-Marc on the Domaine Lafage website that needs a bit of work on its translation to English, but one gets the sense that this is an estate committed to letting the wine express the place. The Lafages want their whites and rosés to reflect the freshness and salinity of the sea breezes that buffet these Mediterrean vineyards. My notes say that Lafage once again scored a trifecta—fruit, mineral and terrific acidity. Another year, another hit for this wine. 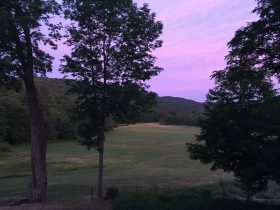 I am enjoying this outside on our upper deck, overlooking the field and being serenaded by the birds. I don’t think this pairing can be beat. Windham Wines makes very conscious, intentional choices about which wines to carry. Given that we must purchase our wines from a distributor in Vermont, even in a small state like ours we have thousands of wines from which to choose. Wedging in every bottle that can be displayed, we can fit only 550 different wines to share with you. 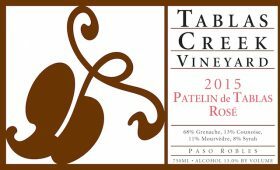 There is no wine in the shop about which we feel more strongly positive than Tablas Creek. Family-owned (the Haas family, who have Vermont connections), biodynamic, dedicated to learning and education which is reflected on their superb blog, the elements come together to create wines of integrity that we are pleased to carry. The Patelin series is their entry-level, but what an introduction. There is a lot going on in the glass, or maybe I am justifying having to enjoy another glass to try to nail down the aromas and flavors. Here are some of the candidates from my notes: nose— tangerine, persimmon, grapefruit, floral, za’atar, something flinty; palate—full, round, mouthfeel with that blue-gray, slate-graphite underlayment to some ripe persimmon (like the large cachi in Italy that, when ripe, you can slice in half and eat with a spoon). Another organic, South of France rosé—this one Ecocert and classically Provencal. 90% of the wine produced in Coteaux Varois en Provence is rosé. The estate name, Annibals, references Hannibal who allegedly drove through the valley of this estate with his elephants and army en route to conquer Rome. The blend is classically Provencal—50% Grenache, 40% Cinsault, 10% Rolle (the last is Vermentino again). Why “suivez-moi-jeune-homme” i.e., follow me, young man? Per Philippe Bourgeois, the importer, it is named after a hat worn by women in the 1920s. The hat had a ribbon that dangled down and swirled in the middle of the young women’s backs, mesmerizing the young men to follow the women and court them. Like the hats, the wine is charming, with pretty fruit notes of orange and apricot, and some nice tart grapefruit as well. This one made the list because it meets all the criteria of a summer sipper—crisp, refreshing, energizing and affordable. A 750ml bottle sells for $11.99. We carry those so that people can try a bottle to know whether they want to commit to a 3 liter box (equivalent to 4 bottles) and, at $29.99, only $7.50 per bottle. With aromas and flavors of apple, grapefruit, lavender and rosemary, this little gem has earned a spot in our fridge for July. The great thing about these bag-in-a-box wines is that the complete absence of oxygen and light, coupled with the coolness of the fridge, means that we have a month to finish its contents. It will not last that long. Boniperti is owned by Gilberto Boniperti and is located in the Alte Piemonte region of Fara. It is a 3.5 hectare estate that grows Nebbiolo, Barbera and Vespolina, the last an off-spring of Nebbiolo (Jancis Robinson, Wine Grapes, p. 1135). As Robinson notes, Vespolina is a “low-yielding” relative of Nebbiolo that is “currently losing ground,” mostly to Barbera which ripens earlier and it more productive. There are only 270 acres (109 ha) of Vespolina, almost all is in Alte Piemonte, though there is a bit in Lombardy. Gilberto cultivates .8 hectares, or just under 2 acres, of Vespolina. Boniperti wisely delegated winemaking to the energetic Cristiano Garella, who is committed to demonstrating the potential of northern Piedont to produce wines of distinction. 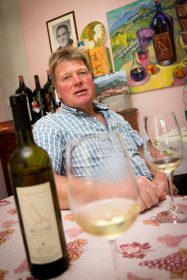 Though he is particularly passionate about Nebbiolo, he has championed the varietals indigenous to the region, including Vespolina. At Boniperti, the grapes are hand-picked, then the Favolalunga ferments and ages in stainless steel for 6 months before bottling. Cristiano led a tasting at Windham Wines earlier this spring. The Favolalunga was very well received. It has aromas of dark berry fruit, cinnamon, violets and sandalwood. On the palate, which is light-bodied and yet full of flavor, we got Luden’s cough drops, some cinnamon and black pepper, minerality and cedar. As I was writing this note today, a friend called to say that she and another friend from out of town had polished off a bottle of the Favolalunga last night. Her friend queried about what made the wine so magical. I think I’ll just site Gilberto Boniperti—land and tradition. That this wine is included on this list will come as no surprise to Windham Wines’ regulars. We have carried this wine since we first tried it just over a year ago; it is hard for us to keep it in stock. Once people try it, they return for more. Sant’Antonio farms 80 hectares at its estate in Valpolicella from which the Crovina comes. Corvina is the principal grape of Amarone, which is made into a very big, extracted wine by drying the grapes before pressing them. The Scaia Corvina does not use dried grapes and is instead a light-to-medium bodied wine with fig and sweet balsamic notes and a light-peppery finish. We have had a love affair with Sicilian wine since we first tasted the COS wines 7 years ago. They were so different, interesting and, importantly, delicious, that we had to pay attention to what was happening with Sicilian wines (sadly, the COS wines are all beyond $20). The tract of land that La Favola owner-winemaker Corrado Gurrieri farms is known locally as “buonivini” good wine. He believes in the power of his land, and its sun and wind, to do the work in his vineyards, which are, not surprisingly, organically farmed. Frappato is a grape that originated in Sicily. It has the aromas and juiciness of fresh strawberries and violets. It is both light-bodied and has some brightness on the finish, making it a good candidate for a red that can take a bit of chill to provide a refreshing summer sipper. Corrado’s Fravolato is dedicated to his two young daughters whose playful, joyful natures he finds reflected in the wine. Pinot Noir, like Frappato, is a terrific summer red when it is picked ripe, but not super-ripe, so that it retains much of its natural acidity. Winemaker Kathleen Inman goes for a more elegant style of Pinot—lighter-bodied, lower-sugar and therefore lower levels of alcohol and bright acidity. Inman owns 10.5 acres in Sonoma’s Russian River Valley, 7.2 of which are planted to Pinot Noir and Pinot Gris and are farmed organically. This entry level wine includes 50% estate fruit with the rest purchased from sustainable vineyards. Kathleen Inman wrote that she neither added or took anything away from the juice—no water, enzymes or tannins were added (yes, they do that sort of thing regularly!) and the acidity is natural. I think that what impresses me is that this is an entry-level wine and it has identity. Its relative lightness will not satisfy those who want a mouthful of wine, and the bright finish may be surprising to New World red wine drinkers. But the flavors are there—tart wild strawberries and sweetened rhubarb, complemented by some savory wet earth aromas and light peaty scents. We fell in love with this wine when we first tried it 4 years ago. Spanish Garnacha is almost never this fresh. Bernabeleva’’s estate vineyards are 80-90 year old vines, farmed organically and fermented and aged in neutral large barrels to preserve freshness. With only 250 cases imported, we always run out of this wine well before the next vintage lands. Here’s what we love: aromas and flavors of raspberry and blueberry, along with something slate and Asian spices like cumin and cardamom. To first time buyers we issue a warning: the wine drinks lighter than its 14%+throw-weight. This wine is so delicious, so easy-drinking, so fresh and supple, that you will be tempted to have not just a second, but perhaps a third glass. Perhaps it is best to put the cork back on and enjoy it again tomorrow. This is certainly the best-value California Cabernet we’ve found in years. The owner-winemakers, Stephanie and Brian Terrizzi, are part of the “new California” generation who do not own vineyards but source fruit from older vineyards tucked about and farmed sustainably, organically, or biodynamically. The fruit comes from vineyards in two American Viticultural Areas (AVAs) in the Paso Robles region, Margaritia and Estrella. This strikes us as a transparent little wine—with nothing artificial or hedonistically-contrived about it. Its fruit is fresh and classically Cabernet cassis and redcurrant. There is also just the slightest echo of tobacco leaf. The mouth is juicy and soft, with tannins only perceptible because we have been drinking mostly whites and rosés for the past 2+ months. No pretensions here. Like most prosecco at this price point, which is what people expect to spend, it is a very large-scale project. We admit to preferring it over the oceans of other proseccos just like it because it has a great presentation. In the world of interchangeable proseccos, this one is the most fun package for summer—flowers. Just about all of our customers know that we are big fans of sparkling. We start all of our many gatherings with it. Since we are also love rosé, a rosé sparkling is a win-win. A wine to “enchant your spirits and your parties,” according to the Domaine Carrel website, the Sparkling rosé is Gamay from the high-altitude Savoie region of the western Alps. The website translation could use a little work, since the wine is described as “agreeable.” We think that it is certainly that, and a bit more!